NH Rifle 2014: Hunt's 1 & 2 - Double Up Again! - the4pointer.com | Real Hunts. Unreal Stories. NH Rifle 2014: Hunt’s 1 & 2 – Double Up Again! By daybreak I had eased my way down the hill to a semi-open hardwoods bordered by tall stands of pine trees and littered with stonewalls and oak trees. This particular location had some decent sign and I knew it to be a common area the deer traveled through to bed down for the day. 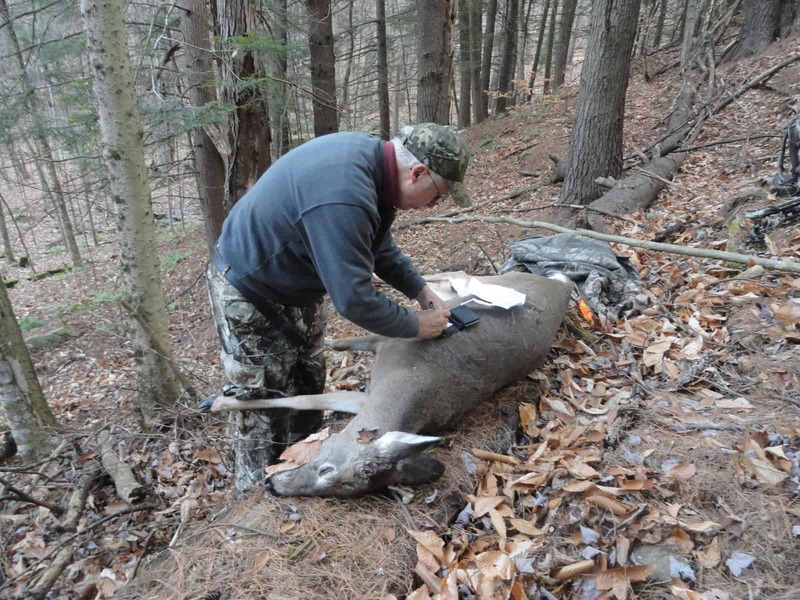 It was the second morning of New Hampshire’s 2014 rifle season and it was the last day that my rifle tag was good for a buck or doe. I’d been given strict instructions from my wife to FILL MY TAG or else she threatened to buy meat elsewhere. As a result, I exercised my trigger finger on and off throughout the morning to make sure I was ready if an opportunity presented itself. I slowly followed a deer trail, moving ten feet and stopping for 5 minutes each time to listen and watch. After only thirty yards I heard the rustle of leaves and caught movement up the hill to my right. Deer! I make it a habit to always stop near a tree when still hunting (thanks to wise instruction from my Dad) in case I suddenly need a rest and it proved very helpful this time. I brought the gun up and supported it on the sapling as I scanned the heads of each deer. All of them were bald. They were moving quick and I had trouble making out which one was the largest. The mandate given to me by my wife was ringing as loud as a gunshot in my ears and I finally settled on one deer which appeared to be the biggest. I paused just long enough in a shooting lane and I squeezed the trigger. Bang. Priorities at work had prevented me from hunting with Dad on Wednesday morning but I was able to get off of work a little early (unexpectedly) and made it to the woods with him by 2:45. He chose to sit in an old faithful stand and I picked out a tree to sit against 200 yards further down the ridge to the north. At 3:15 I was thinking about sleeping when I heard dad shoot. I was instantly on my feet in case any stragglers ran by me after his shot but there were none. He let me know what happened and I headed over to look for signs of a hit. There was plenty of blood and he climbed down from his stand to join me in the recovery. 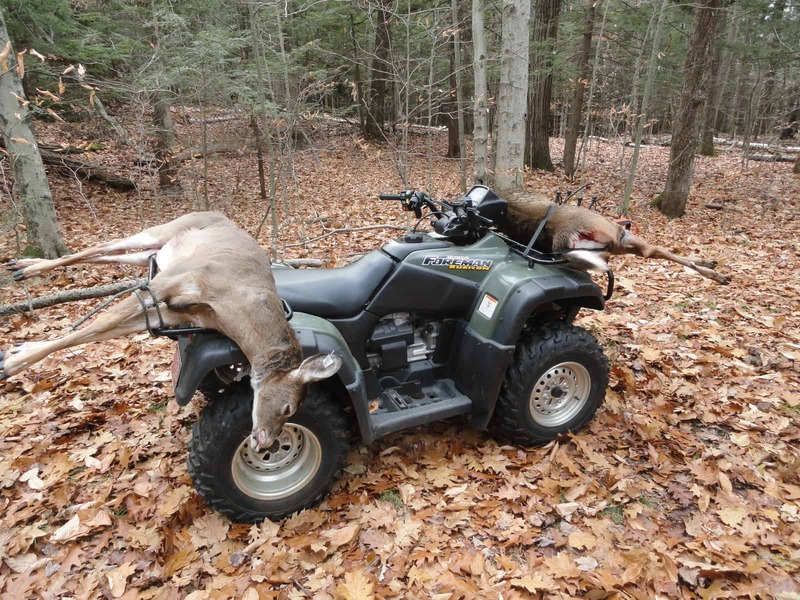 Since it was the first day of New Hampshire Rifle he hadn’t checked for antlers so we didn’t know what we would find when we recovered the deer. The blood trail was heavy. The deer was bleeding from both sides of its body but after 200 yards we still couldn’t find the deer. We kept thinking that after each rise in the terrain we would find the deer but no such luck. It just kept going and it just kept bleeding. 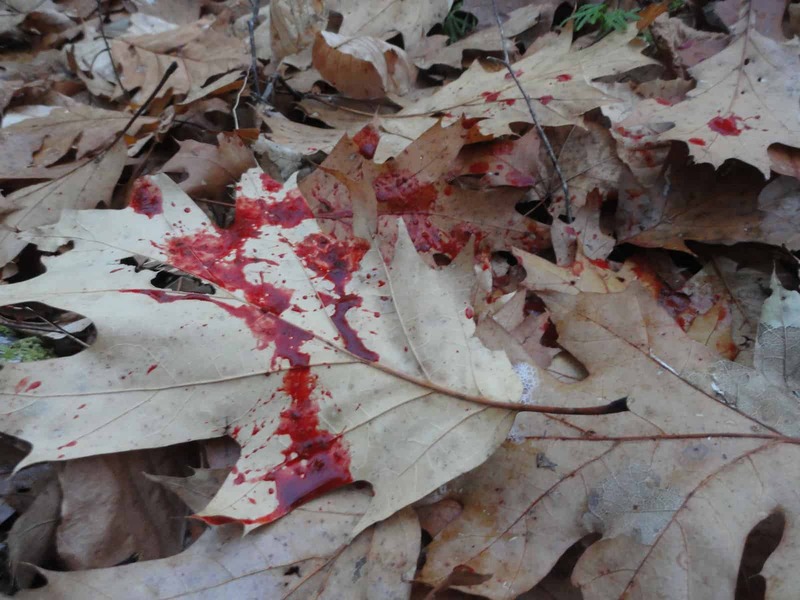 I have never followed a blood trail that was so heavy for so long and come up empty. After 400-500 yards we decided it would be best to return in the morning. Surely a deer that had lost that much blood would bed up soon and we’d find it quick the next day. A plan was made that night for me to be on the trail at daybreak the next morning and to have Dad and Josh work their way towards me after it got light out in hopes they might run a deer by me. The plan worked (although the deer didn’t come from them) and they met up with me before I went to look for my deer. It had run off but I could tell the hit was solid. I had been standing on the blood trail from Dad’s deer when I shot mine and Josh and I went to look for it while Dad stayed behind to keep following his trail. The recovery was quick for my deer and I was a bit disappointed at the size (I blame my wife for the itchy trigger finger). Clearly I had chosen the wrong deer in the heat of the moment but there isn’t much I can do about that now. It’s meat in the freezer anyway. After another 150 yards we finally found his deer over a steep bank. As I said earlier, I have never seen a deer bleed that much and run that far. Google Earth measured the distance from the shot to the recovery as 580 yards in a straight line, and trust me, it did not run in a straight line! Thankfully, we were able to find her and no meat was wasted. We were also thankful that Josh and some other great friends out hunting with us to help us drag the deer up from the bottom of the hill! It was a fun and interesting 24 hours. No, they weren’t big bucks, but the longer I hunt the more I realize that doesn’t matter as much. Sure it would have been great to drag two big 8 points out of the woods but great memories don’t always have to be measured in the number of points on a rack and this is one I hope to not soon forget.